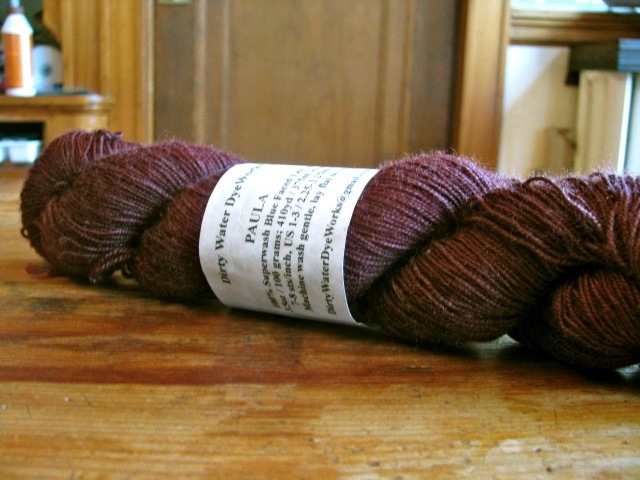 Last week I was debating which color yarn to use for a new project - brown, gray or red. 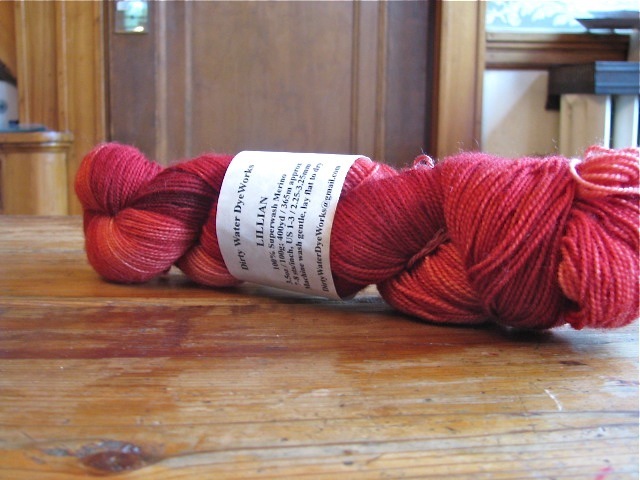 While I love all three colors, the red skein won out. We were in that cycle of gray, dreary days. The red definitely lifted my spirits. Even though I am still in the midst of my Sweet Bunting obsession - dyeing yarn, knitting sweaters - I did manage to spend a little time with the skein of red. I didn't have a sock on the needles and felt lost without one. 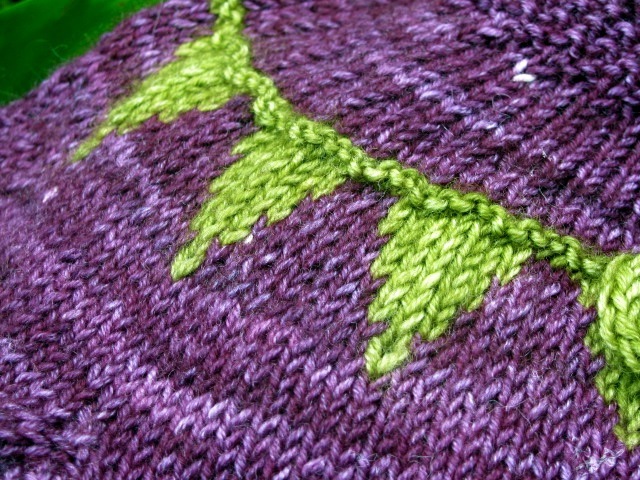 Now I have Hedgerow Socks to keep me company. 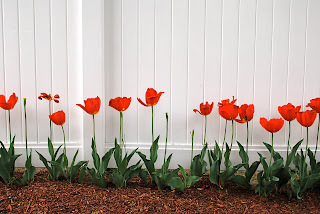 A few weeks ago these tulips caught my eye. The reflection of red on a glistening white fence. 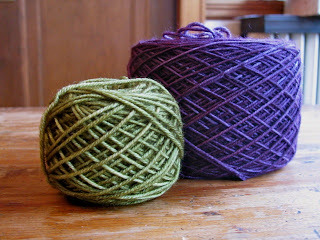 If you knit stranded colorwork, you understand that sometimes color is all about the contrast. 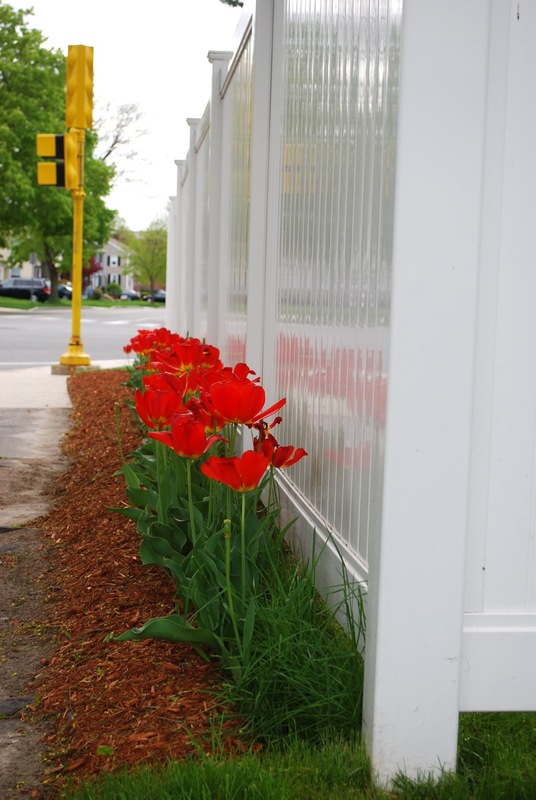 These red tulips wouldn't be nearly so striking without the white fence. 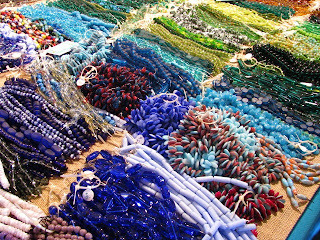 They are my color inspiration for the week. A few months ago I learned that not one, but two friends were having babies - babies with very close due dates. To a knitter new baby translates into new baby sweater. It's been a while since anyone in my family or circle of friends has had a baby, so I was excited with the prospect of knitting a couple of baby sweaters. I had plenty of advance notice. I would knit these sweaters and have time to spare. I didn't give it much thought because I had so much time. I knew from experience that it didn't take long to knit a baby sweater. As we moved from winter to spring, from April to May my husband reminded me about the sweaters. The babies are going to be here soon, I was warned. I should note that one of the parents is a close friend of his, so he has a vested interest in this sweater project. I started the process of looking at patterns for baby sweaters. I have made so many baby sweaters over the years that my collection of patterns is quite extensive, but I wanted something new. Something fresh. Then I had the bright idea that while I was at it, I might as well dye the yarn for the sweaters. These baby sweaters were going to be beyond special. I picked a pattern and started playing around with colors. With so many options it was hard to choose. 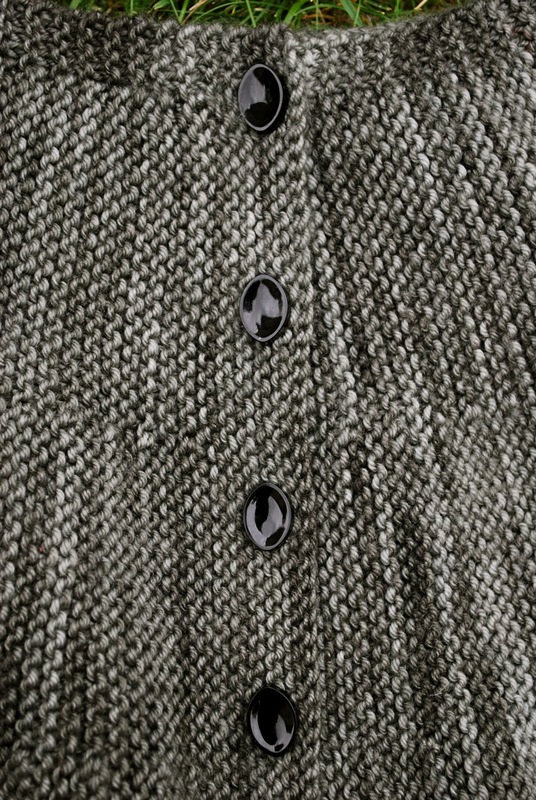 I finally settled on this combination for one of the sweaters. The pattern is Sweet Bunting Cardigan by Laura Chau. 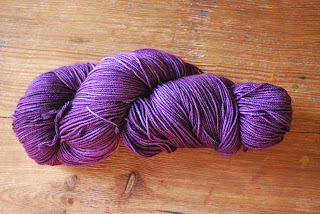 The yarn is 100% superwash merino. Both the yarn line and the colorways are currently unnamed. This design has charming details. 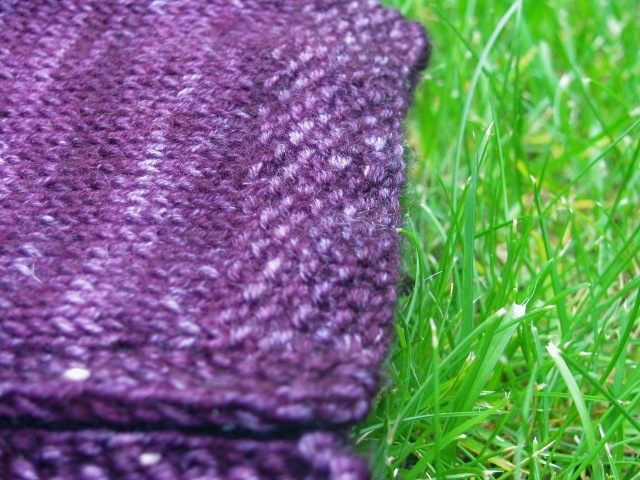 A seed stitch band along the bottom edge. To make it interesting there's a bit of colorwork. Little flags along the yoke. As so often happens one thing leads to another, and this project has taken on a life of its own. It dawned on me that I could offer this sweater as a kit - and that's what I'm doing. 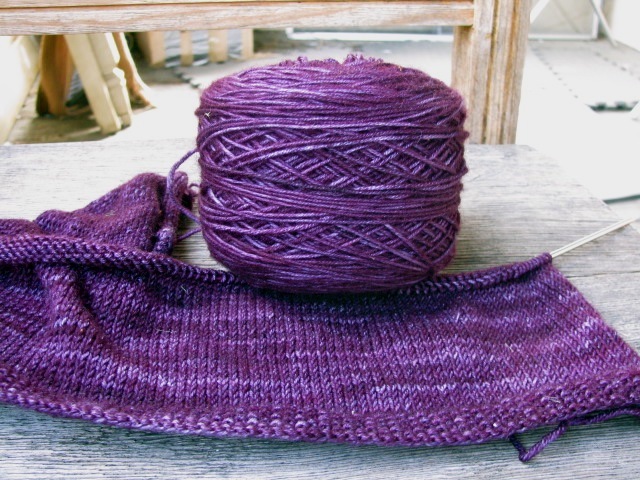 This sweater kit will be available in four different sizes, each with three different color combinations. 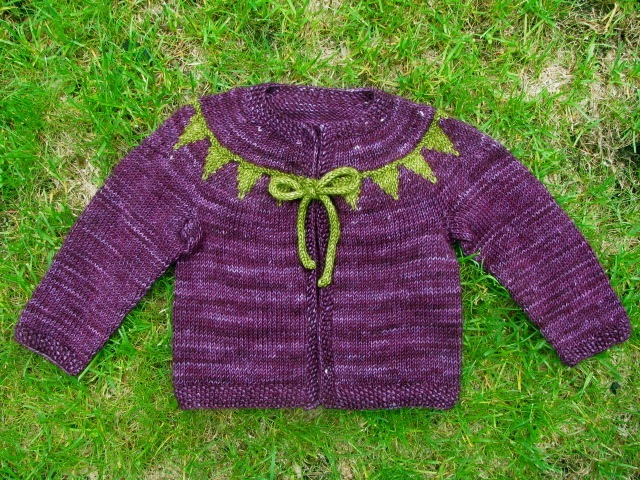 That means I still have two sweaters to knit - one for the second baby, the other for a booth sample. And there's still time to spare. Neither of the babies has been born. Yet. I spent a delightful Saturday this past weekend at the Rhode Island Wool and Fiber Festival. 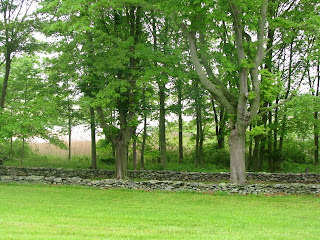 This one day event is held on the grounds of Coggeshall Farm. 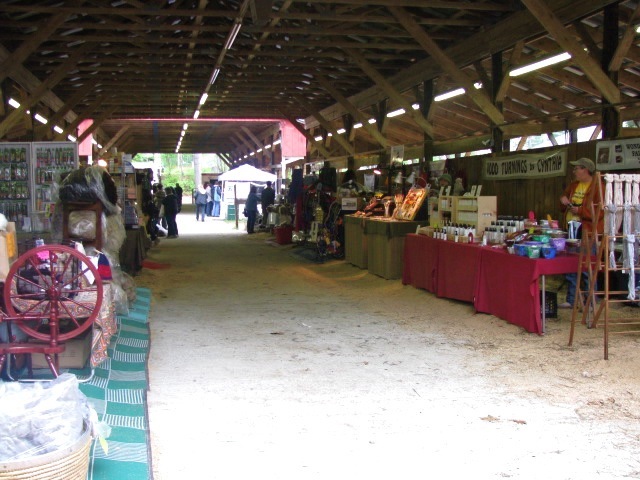 All of the vendors were outside. The day started with dense fog, clouds and a bit of drizzle. Given our recent wet weather pattern, vendors were concerned about rain. There was nothing to be worried about. By noon the sun was out, and the day turned warm. 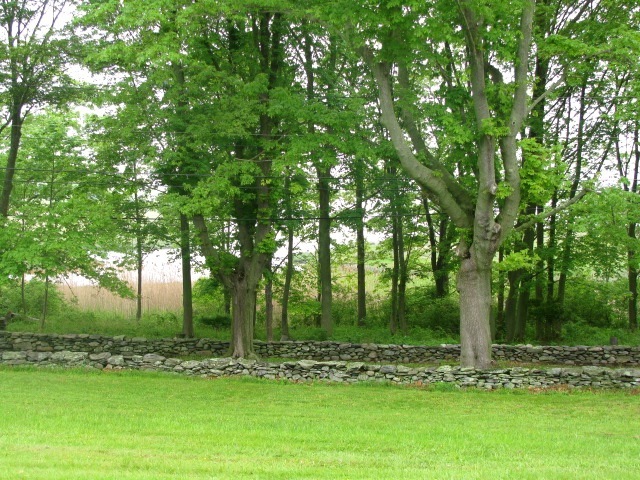 Coggeshall Farm is in a beautiful location off a winding road with ocean views. 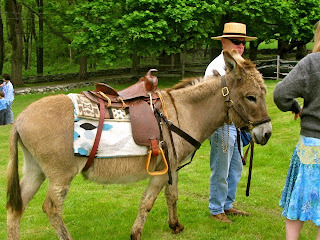 The farm is a living history museum with interpreters dressed in period costumes performing farm tasks from the late 18th century. 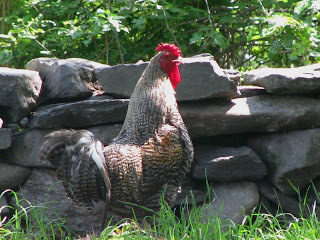 The farm has many animals. Chickens roamed around by the barn. 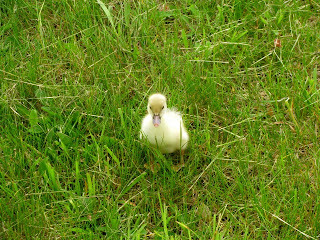 And this baby duck felt right at home. She came all the way from Maine with one of the vendors. It was good to see so many of my Rhode Island friends. It was a relaxing day to hang out and spin or knit. Beautiful setting, wonderful people. It was an enjoyable Saturday in Rhode Island. 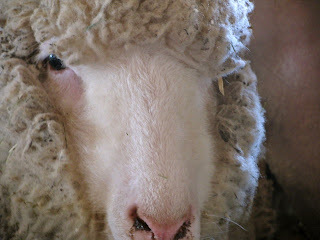 I'm packing for Rhode Island Wool and Fiber Festival. I should be packing. I had the bright idea that I need to start a new knitting project, so I've taken a slight detour. 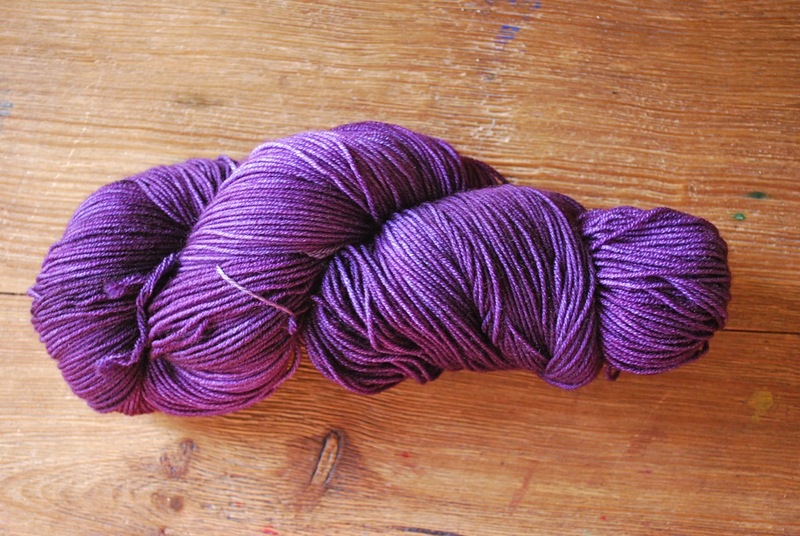 I have a pattern in mind and am considering this yarn. I thought the situation was manageable - pick one color or the other. Things became a bit more complicated when I started thinking about a second pattern. 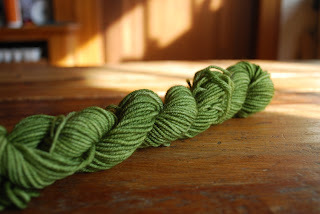 That's when I pulled this yarn. I know I'm procrastinating. Packing isn't fun, but at least now I can contemplate these options while I load everything up. 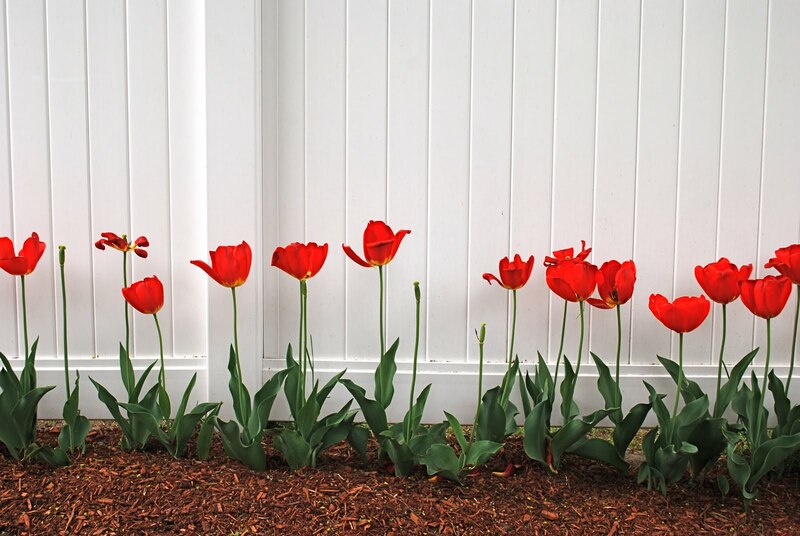 After an endless string of gray, foggy, drizzly, damp days there's a good chance the red one will win out. I don't need the sun to brighten my day. 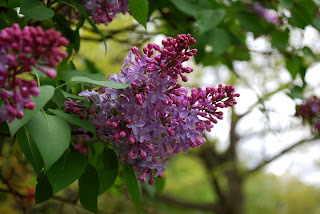 Lilacs are one of my springtime favorites. Their delicate, rich purple is my color inspiration for this week. I'm doing my best to go with the flow. Today is not taking shape the way I had intended, but my current knitting project is. As evidence of how my day has gone awry this picture was taken at the car dealership where a "quick" appointment took all morning and then some. This wee sweater is Sweet Bunting. It has come together quickly, and I'm about to start the yoke colorwork. 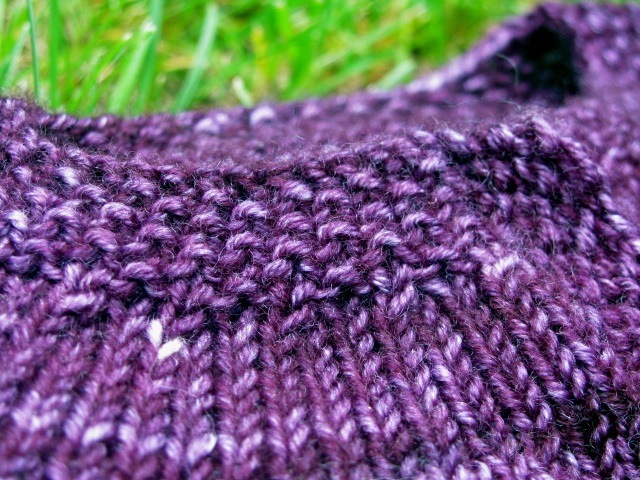 There's nothing like knitting a baby sweater to lift my spirits and salvage my day. 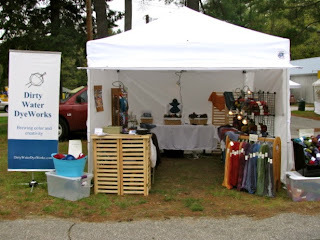 This past weekend I was a vendor at New Hampshire Sheep and Wool. This event is always an adventure and has a reputation for less than ideal weather. We set up camp in record time. The colors stood out against the white background. Saturday was cloudy but dry. 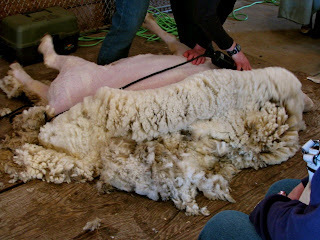 It was a cool, comfortable day to be at a sheep and wool festival. Thanks to everyone who stopped by the booth. It's fun to chat with friends and make new acquaintances. I wore my Corinne sweater on Saturday and was delighted with a visit from Crystal Erb Junkins, the designer. New Hampshire Sheep and Wool is a big event. 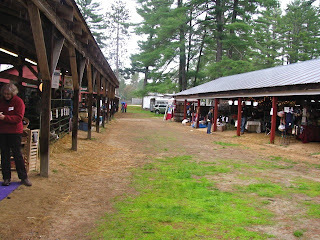 Barns and buildings filled with vendors. 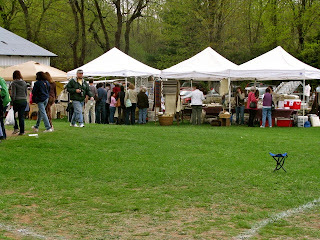 And more vendors. Booth after booth full of creativity and inspiration. One booth had this beautiful shawl on display. 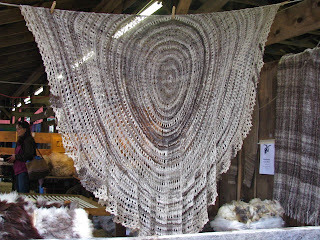 It's made from yarn spun from a Jacob fleece. There were Jacob pelts in the same booth. Jacob sheep have such wonderful color variation. I saw people test drive new spinning wheels. I was intrigued by the Schacht Sidekick but declined an invitation to try it. I knew it would be all downhill if I gave it a whirl. 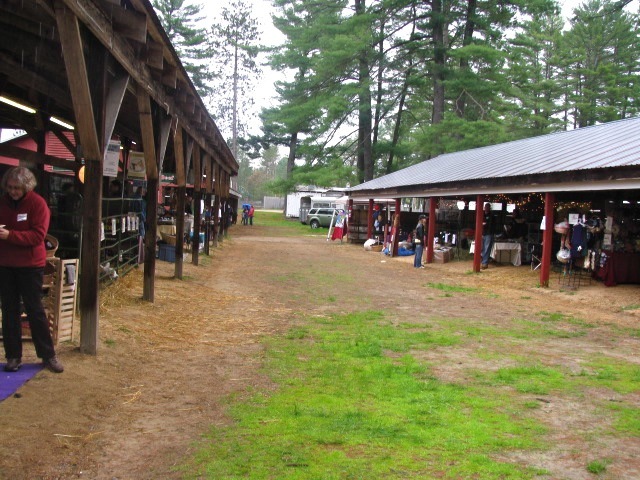 All weekend I watched people leave the fairgrounds, weighed down with bags and bags of fleece. One woman commented that she hadn't been to this event in a few years and was making up for lost time. I may have come home empty-handed, but I'm inspired to spin from my stash. 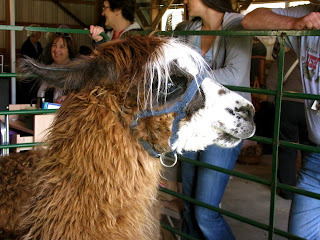 There were animals of every kind. 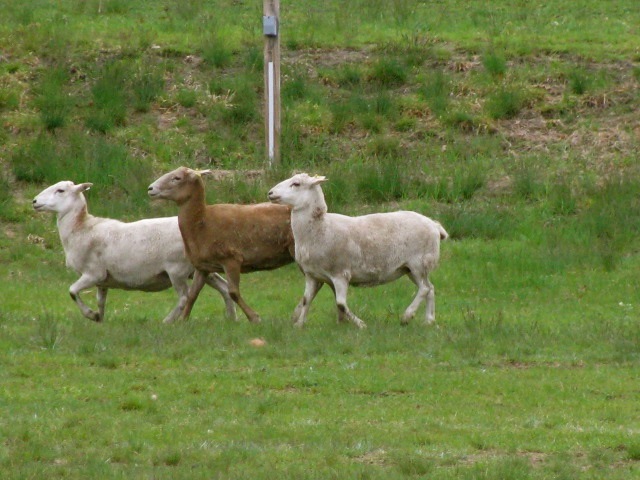 Sheep waiting to be herded. This one sat patiently for a spinning session. 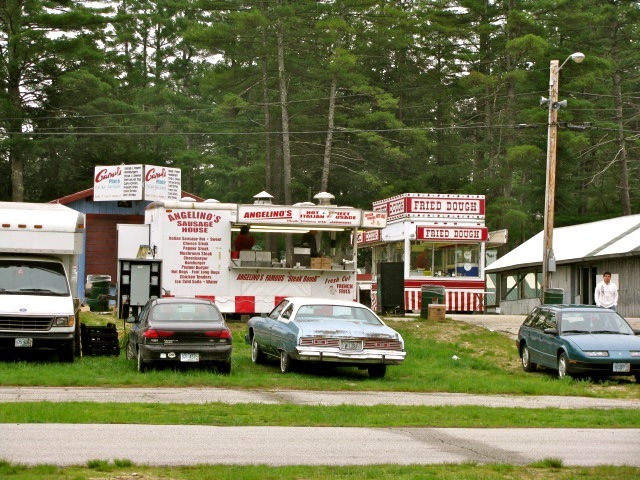 When you're at a fairgrounds, you have to have fair food. Fried dough, kettle corn, baked goods, ice cream, hot dogs, hamburgers, falafel, Italian sausage, Indian pudding, apple crisp, pretzels. All this and more. 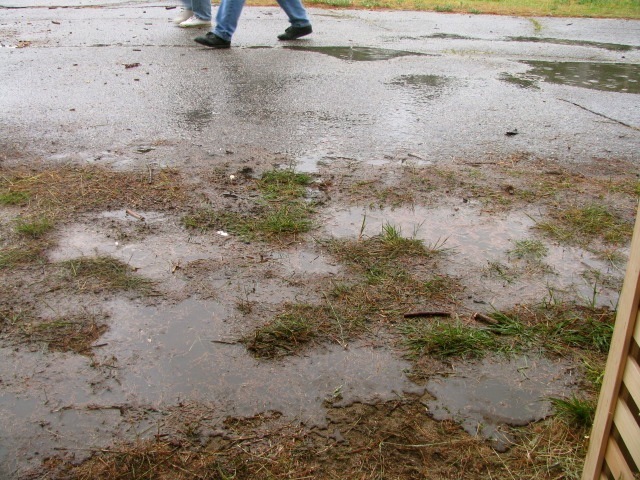 On Sunday the weather turned wet. This puddle formed just outside the booth. Slowly it made its way inside. 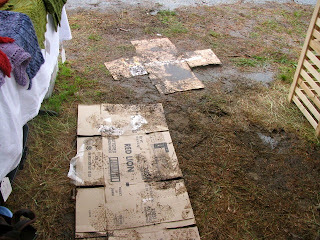 I tried to keep it at bay, but by the end of the day this cardboard was under water. It's all part of the adventure. The rain came down heavy just in time for tearing down the booth. I gave up all efforts to stay dry and looked like a drowned rat by the time everything was loaded. 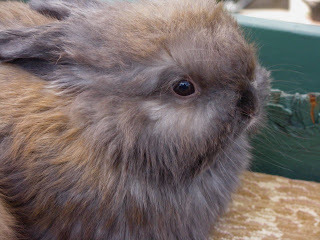 I'm still drying out from the weekend and probably will be for the next couple of days. But it was worth it. New Hampshire Sheep and Wool is this weekend. 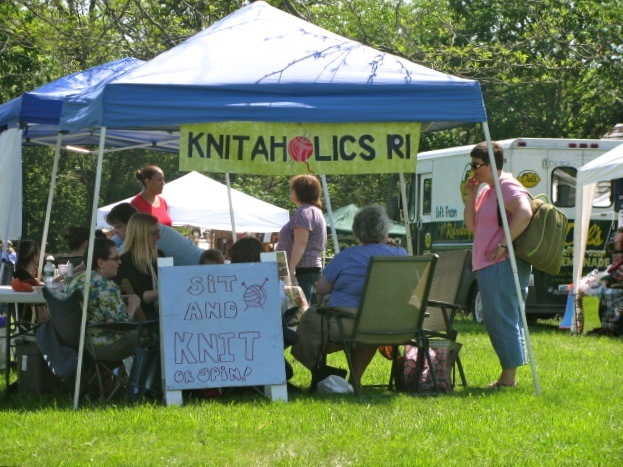 I've been busy getting ready for this event - so busy that I shouldn't be spending time on a new knitting project. But I am weak. There's a new project brewing. I have a new yarn base dyed in new colors. I cast on, but I couldn't stop there. I had to knit just a few rows. I'll probably be too busy over the weekend to work on my latest obsession, but I'll have it with me just in case. My neighbors down the street have a beautiful color display in their yard right now. At first glance you would think this tree has two colors, but it's really two separate trees planted closely together. They are my color inspiration for the week. 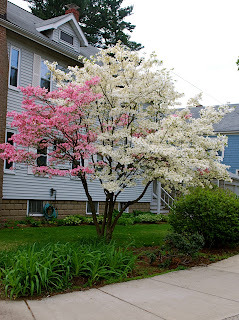 Pink and white side by side. Corinne is off the needles. After hours of knitting row after row of glorious garter I was sad to see it come to an end. 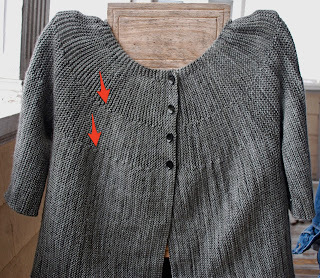 This sweater is knit in one piece from side to side. The only finishing is grafting the sleeve seams and sewing on the buttons. 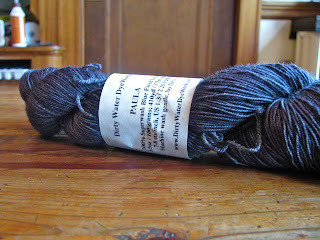 The yarn is Dirty Water DyeWorks Marie, colorway Slate. 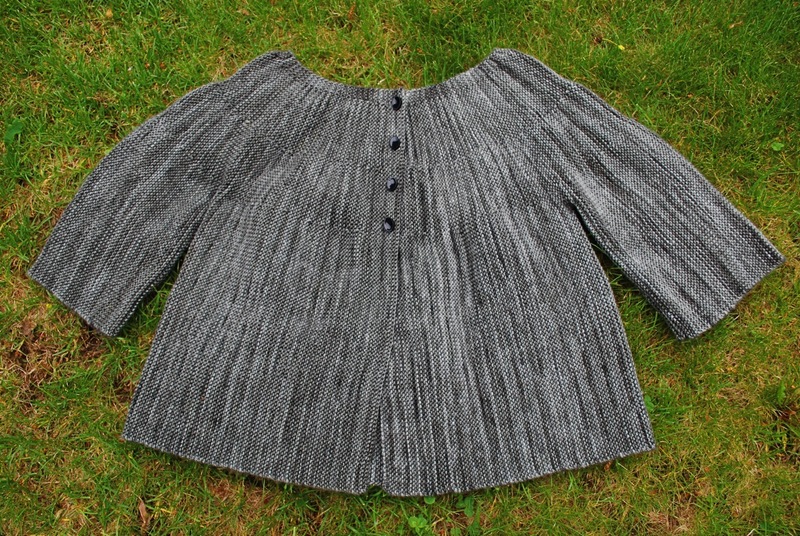 This DK weight blend of merino, cashmere and nylon knits up quickly and makes a soft, comfy garment. 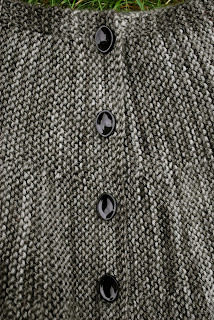 This design uses a short row repeat to shape the sweater. 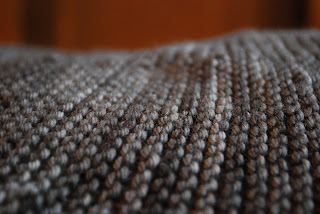 The short rows create simple textured lines. I made one modification. The neckband isn't knit as a separate piece so it lacks the stability of one created by picking up stitches along a cast off edge. 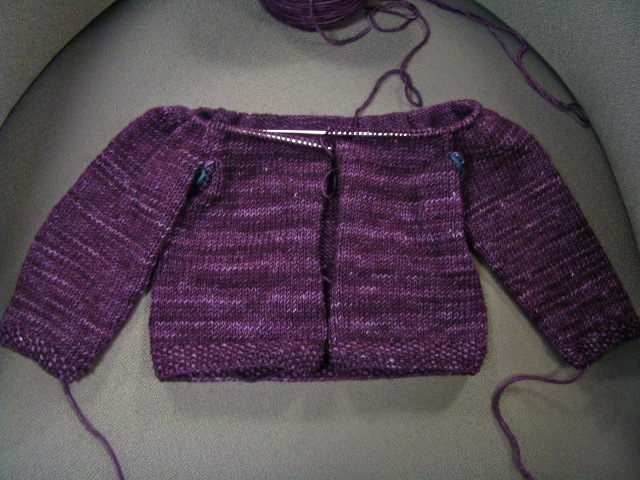 I was afraid that with time the neckband would stretch from the weight of the sweater. 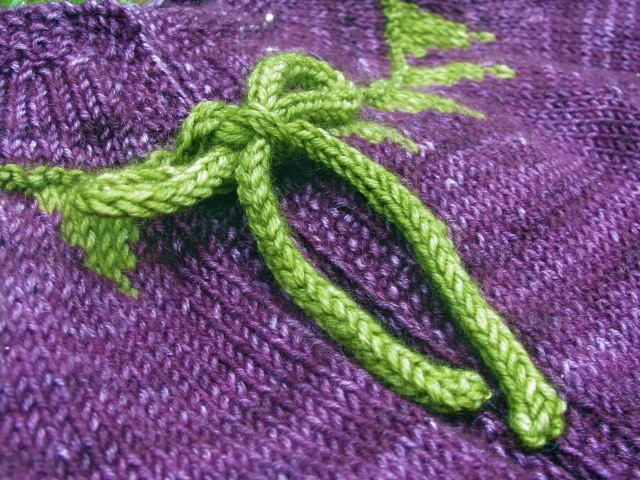 To reinforce the neckband I crocheted a chain along the inside edge. You can find clear instructions for this technique here. Part of the fun was picking out the buttons. 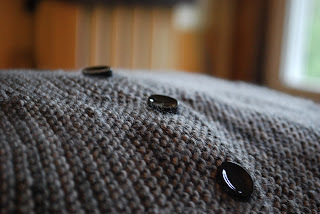 I chose these glistening black ovals from the vintage button selection at Gather Here. The temps are still cool. Corinne is ready to wear. Maryland Sheep and Wool was this past weekend. I've never been, but all weekend I was reading comments online. There's so much to see, so much to do. It's an event not to be missed. 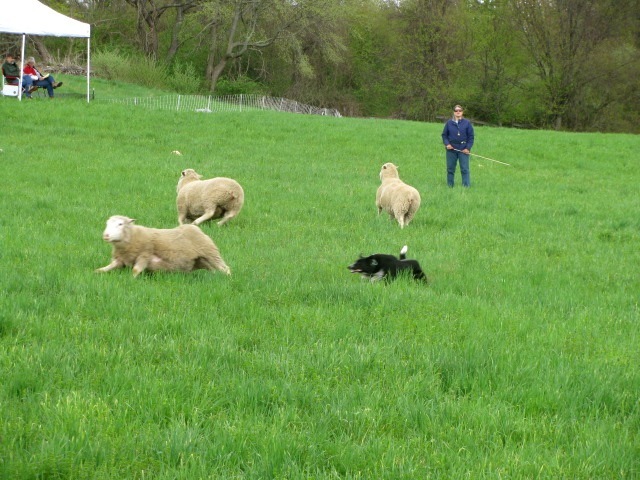 Earlier this spring a fiber friend told me I had to go just to experience it. "Don't go as a vendor," he said. "Go to have fun." But it never seems to work out. Spring is a busy time of year. I have a full vending schedule, and Maryland is not a short day trip from New England. While I was reading about the good times I was missing down in Maryland, I decided I needed a little pick-me-up. 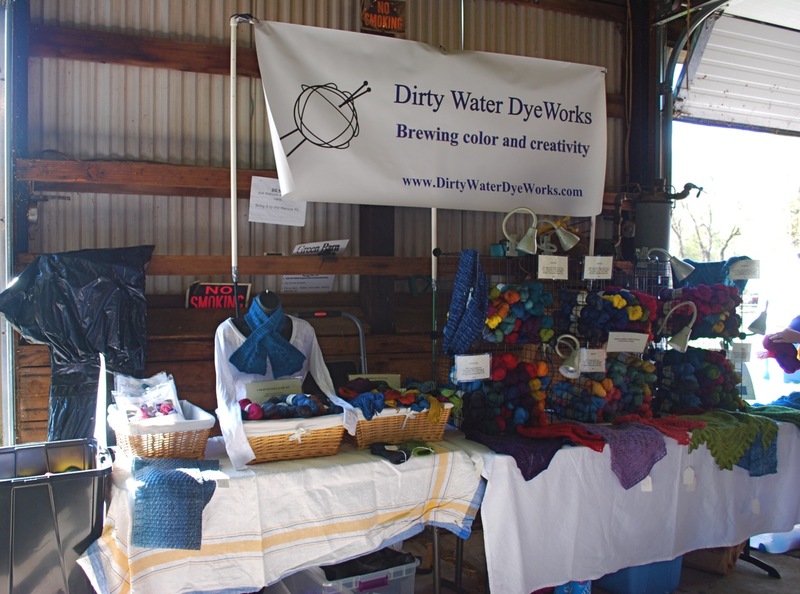 Out came the dye pots. I've been contemplating a new project. And a splash of this. That's all it took to make me feel better. I'm sure I missed loads of fun in Maryland, but I had some fun of my own. I've been working exclusively on Corinne. Hour after soothing hour of garter. 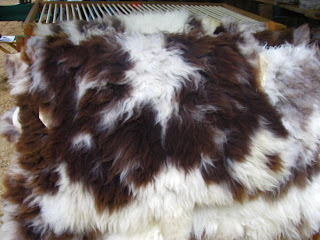 This one piece wonder is worked side to side from left front around the back to the right front. 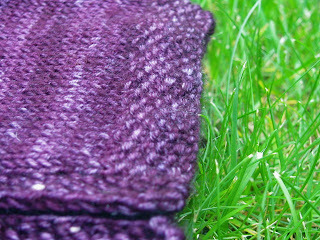 I finished the back and am knitting the right sleeve. Then it's on to the right front, and I'll be done. The only finishing is the sleeve seams. I'm already starting to contemplate buttons. I love garter stitch, and the timing of this project couldn't have been better. 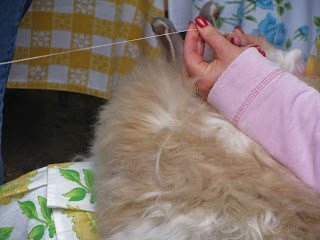 Even when my attention is being pulled in several different directions, I can still knit - back and forth, back and forth. 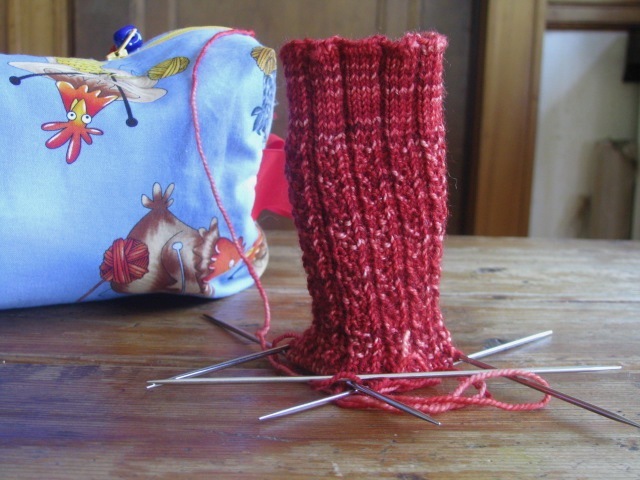 Since I don't have a sock on the needles (how did that happen? ), this project has been my traveling companion. The only drawback is that a one piece sweater gets heavy and cumbersome. Now that I'm in the home stretch, it doesn't really matter. 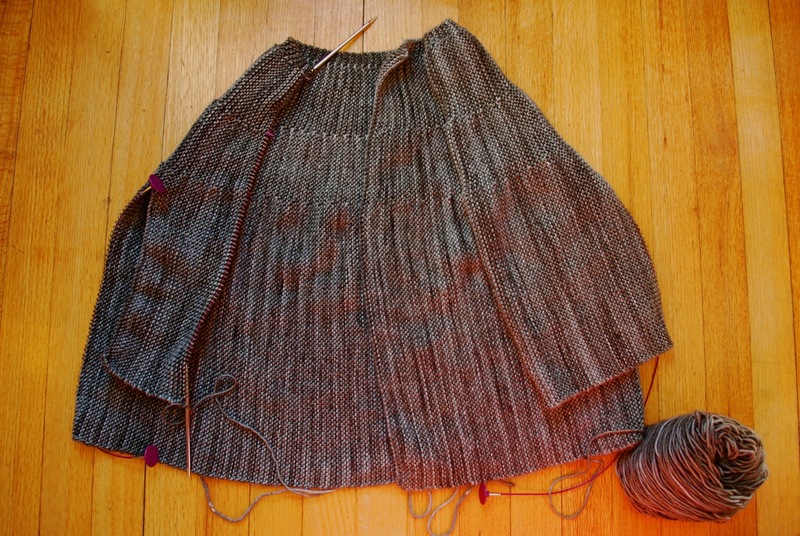 I'm not working on anything else until this sweater is finished. It's May. That doesn't mean I won't need my woolens, but the days are getting warmer. My color inspiration for the week comes from our May Day celebration. 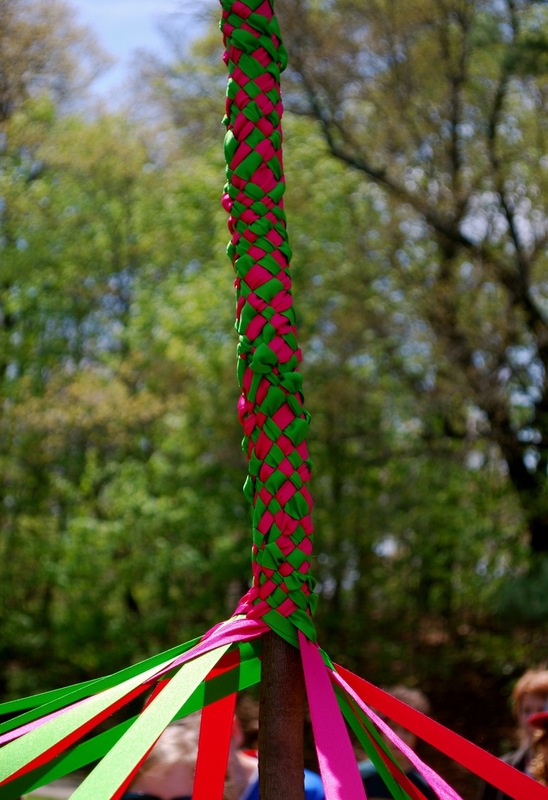 Pink and green woven together. ~ There are more and more sightings of yarn bombing. 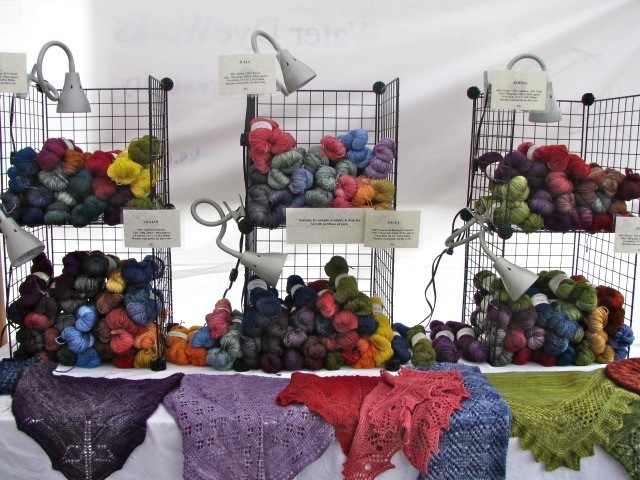 I enjoy the clever, creative ways people are decorating with knitting, making the world a more colorful place. 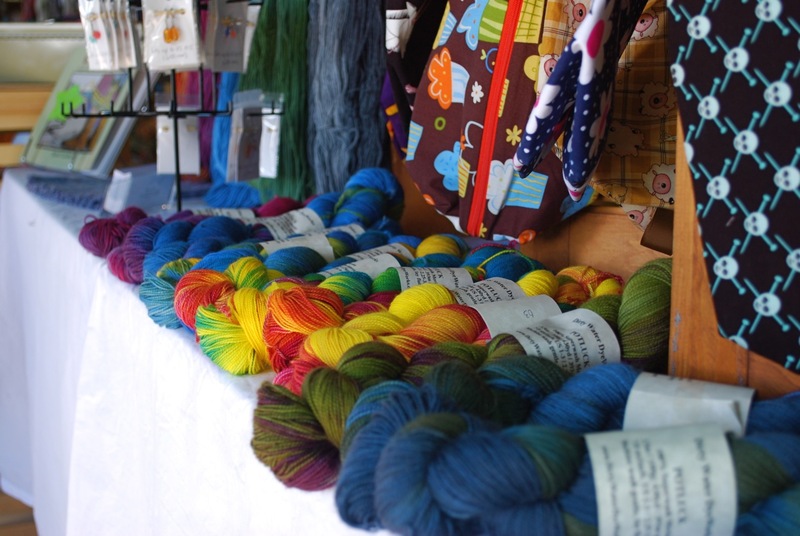 The Yarn Graffiti Documentary is a project that aims to chronicle yarn bombing. It's an ambitious undertaking. Be sure to watch the video clip. 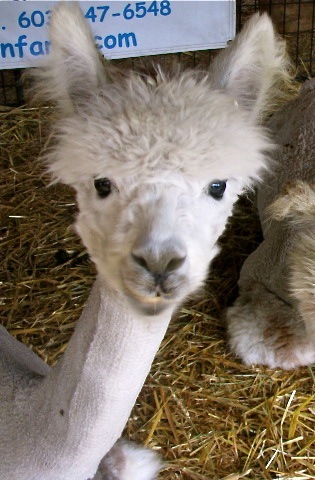 ~ Language is a lot of fun and more so when you say it in llama. Who comes up with these ideas? ~ Finally, take a look at this giant cardigan for two. 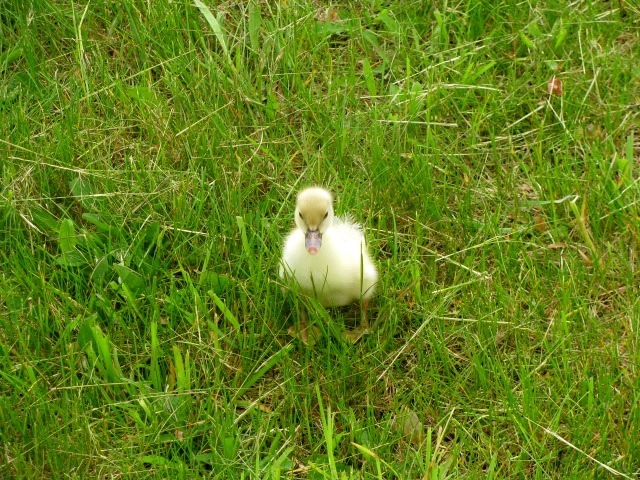 Such an adorable picture. I wonder how long it took to make this sweater built for two. My head is still spinning from a whirlwind weekend. 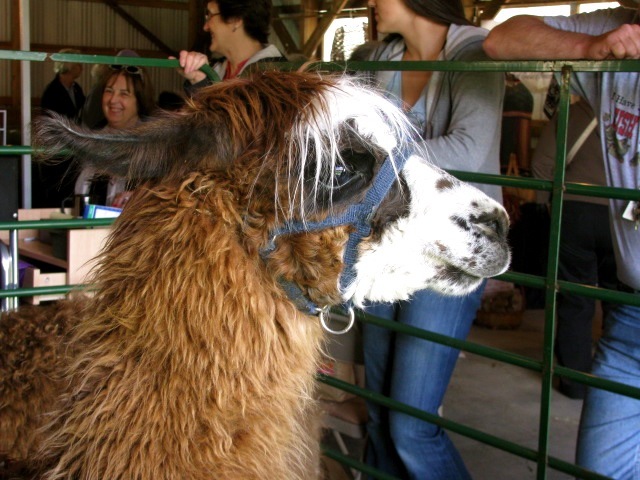 It was a fun-filled Saturday at Connecticut Sheep, Wool and Fiber Festival. The day started early with the drive to Connecticut. 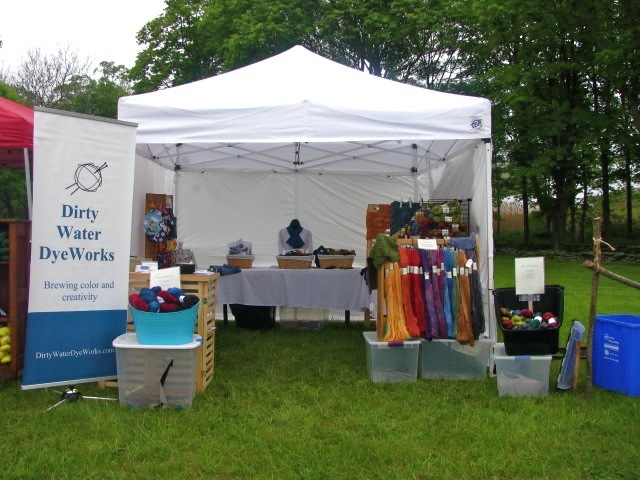 The booth was set up and ready before the festival opened. I've had this booth space before but with a different layout. This year I kept both sides open. People walked through from one side to the other, and it was much less congested. There was plenty of space to display everything. 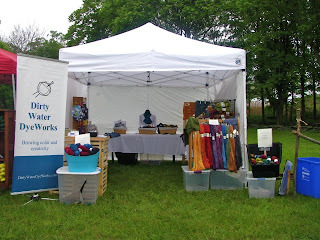 The festival wasn't just about yarn and fiber. 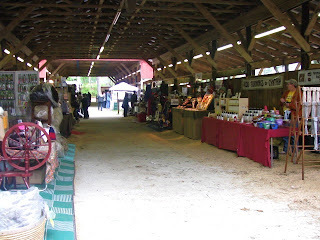 There were vendors with everything from knitting bags to spinning wheels, from buttons to maple syrup. 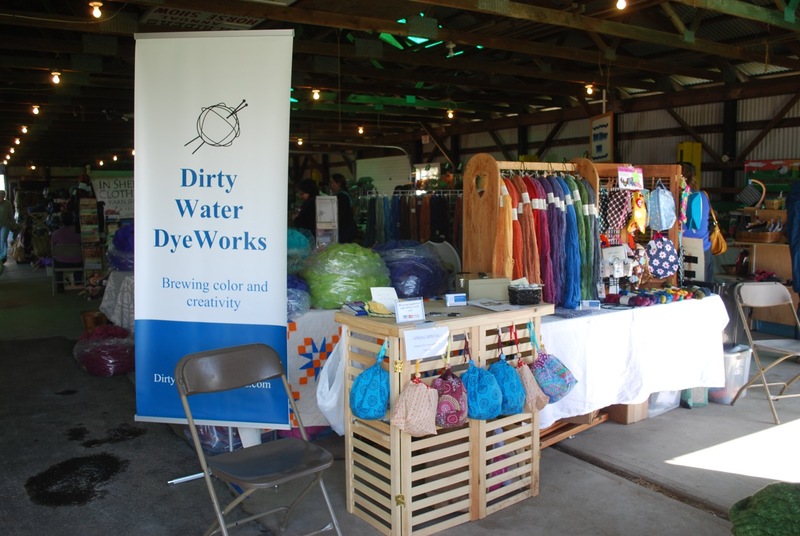 It was a beautiful day to be vending outside. The day started sunny and warm but turned cloudy and cooler in the afternoon. There were animals inside and out. From big animals to small. Triple. 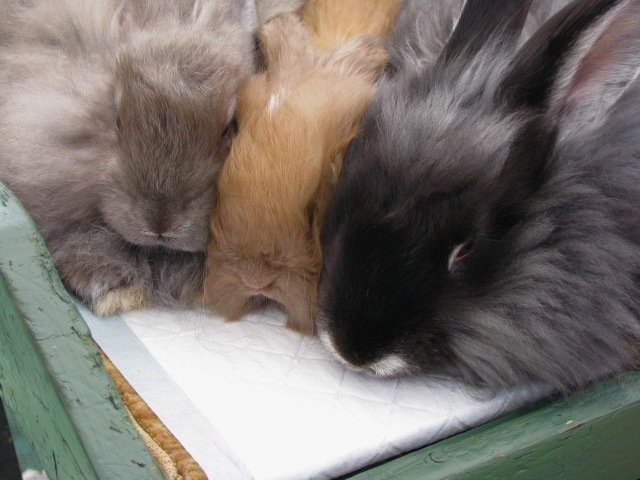 Snuggling balls of fluff. Thanks to everyone who stopped by the booth. It was fun to meet so many online connections. Now I'm off to assess the damage from this event and start preparing for the next one.